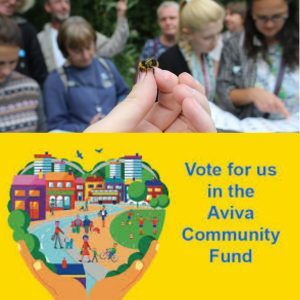 Vote for us in the Aviva Community Awards 2018! How are the bumblebees doing? It’s a question we are often asked here at the Bumblebee Conservation Trust, and one which you can help us answer by voting for us in the Aviva Community Awards 2018! We submitted our national recording project ‘BeeWalk’ for the 2018 Aviva funding awards. To get through to the next round we need your votes. Everyone can vote and the project with the most votes will be entered into the finals where a judging panel will award funding. Each voter can cast 10 votes for the same project or split between different projects. The end goal is to secure up to £25,000 for ‘BeeWalk’ from Aviva. This substantial amount would go a long way towards funding BeeWalk for an entire year, ensuring we can continue to deliver bumblebee ID training sessions across the UK, and collate and analyse the vital data. What do we do with the data? Our Science team take the data submitted by BeeWalkers (291,321 records of individual bees up to the end of 2017! ), and analyse year on year trends and patterns in bumblebee populations. BeeWalk data acts as an early warning system for potential problems, and allows us to target our conservation efforts where they are most needed. Click here to register your 10 votes!